Audi is one of the world’s leading automakers, but their massive inventory of automobiles was previously only managed using several complex spreadsheets shared amongst regional dealers. While this system worked, it didn’t provide real-time, actionable intelligence about their supply chain from the moment an automobile is ordered to the moment it arrives on the dealer lot, meaning things were a lot harder for Audi’s dealers than they had to be. A product shouldn’t just meet requirements; it should solve a real problem and improve a real business process, which is why we spent the necessary time workshopping directly with Audi to fully understand the complexities of their business. We wanted to design and implement a product that would allow them to easily measure KPIs at every point in their supply train, from the factory floor all the way to the dealer lot. Our initial workshops made it clear that while selecting the appropriate tech stack to integrate with Audi’s existing system was important, a UX-first approach would be the only way make a product that allowed Audi to easily visualize those massive amounts of data and take action immediately from within the application. This is why we designed and built an application that was highly useable across all iOS devices and that was supported by a robust web-based admin dashboard, thus ensuring that relevant data was served to the auto dealers who needed it most. 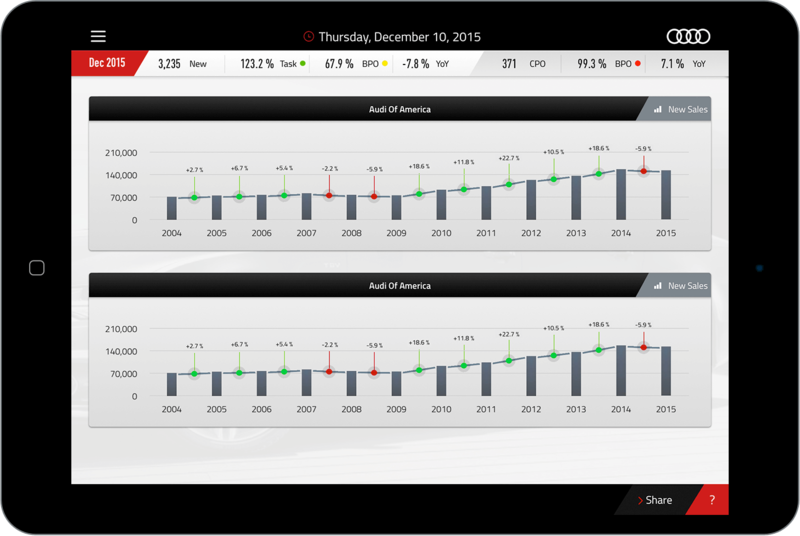 Audi is one of the world’s leading automakers, with a massive inventory of automobiles that was managed using several complex spreadsheets shared amongst regional dealers. While their system of spreadsheets worked, it didn’t provide real-time actionable intelligence about their supply chain from the moment an automobile is ordered to the moment it arrives on the dealer lot. The supply chain for an automobile manufacturer the size of Audi is understandably complex, but working with that supply chain in real-time didn’t have to be. By leveraging modern interface designs and interactions to work seamlessly with an intelligent backend layer — and by making it all accessible on a tablet — we would make a game-changing internal product at Audi. 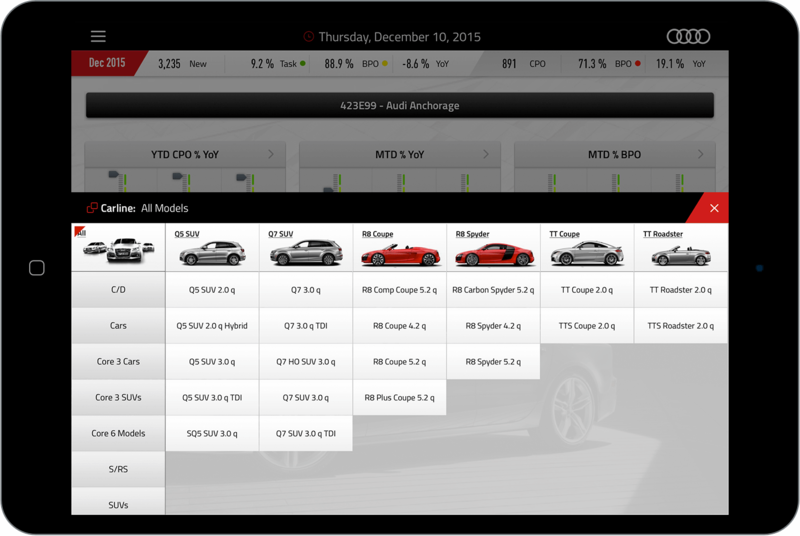 Our product and design team worked closely with Audi to make sure that every detail of every app view was just right. We started with the iPad experience because it was the primary device the app would be used on. 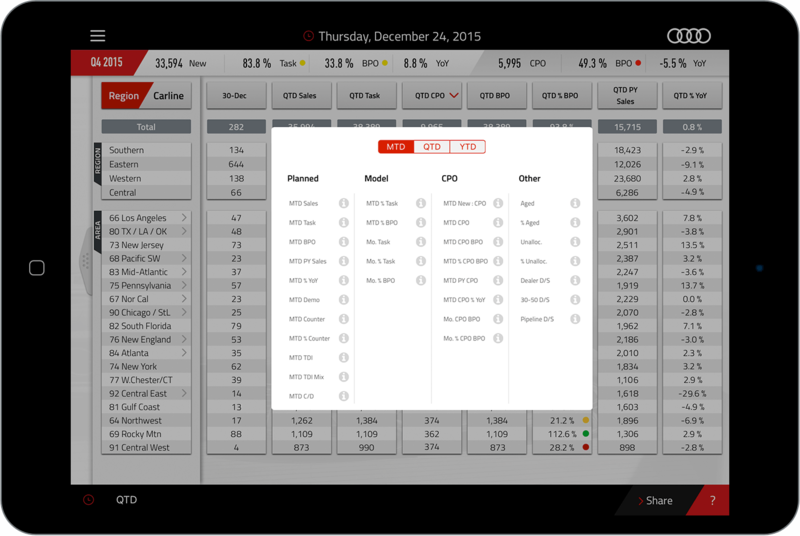 The larger screen real estate allowed us to create fully-detailed views, and they were laid out in way that highlighted the KPI of interest for a particular end-user. The design challenge here was to create views that showed lots of data while still keeping each view focused on just a few KPIs at a time — that way Audi reps would be able to make an informed decision, which would then be acted upon directly in the application. Knowing that actionable data intelligence about Audi’s supply chain was the crucial mark for success on this project, we focused our efforts on architecting an API that considered every aspect of Audi’s daily operations, starting with the moment the first piece of manually-collected data went digital. Our API unified several data sets and securely brought them together in our custom database, which was then scrubbed automatically using proprietary algorithms that would surface the most important KPIs to the end user on an iOS device. 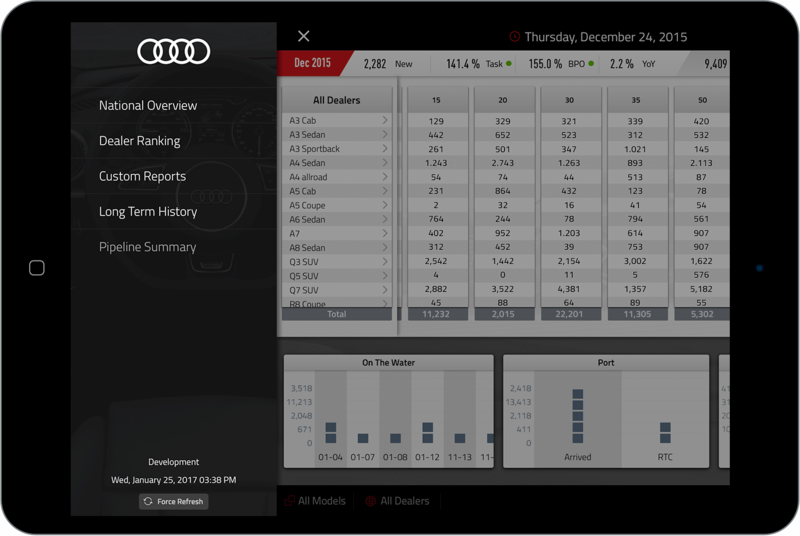 Our interaction design coupled with a thorough use-case analysis allowed us to build a product that changed the way Audi thinks about their supply chain and let them capture the maximum revenue possible, from the factory floor all the way to the dealer lots. 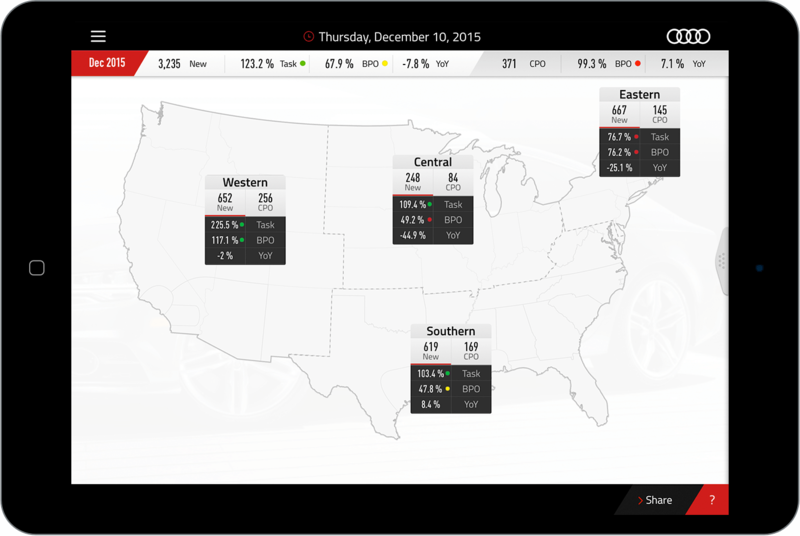 To say that Audi’s supply chain can be visualized and managed from an iPad is bold, but we’ve done it.